A troubled engineering firm which has been offered a £15m loan by the Scottish government is being sued over "substantial outstanding payments". 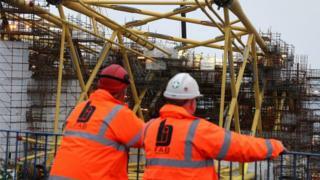 Fife-based BiFab, which employs 1,400 people, was saved from administration by the government move last year. It now faces legal action from one of its business partners, German firm EEW. Both companies have been working on contracts for the £2.6bn Beatrice Offshore Windfarm in the Outer Moray Firth. A spokesman for EEW, which specialises in making large-diameter steel pipes, confirmed the legal action but said no further comment could be made on ongoing proceedings. BiFab, which has yards in Burntisland in Fife and on Lewis, reached an agreement with business partners in November to receive payments to alleviate its "immediate cash flow issues". Scotland's economy secretary, Keith Brown, said at the time that if the offer of the £15m loan was required, it would be extended to the firm on commercial terms. Responding to news of the legal action, the Scottish government said it "continued to work with the company, investors and relevant parties to ensure a strong, sustainable future for BiFab and the people it employs". A spokesman said: "The Scottish government and our agencies are working with the management team at BiFab to secure new business and investment in the company, and through this we hope to provide the best means of creating and safeguarding jobs for the longer term for communities in both Fife and the Isle of Lewis." BiFab has yet to respond to a BBC Scotland request for a comment on the dispute. But Alan Ritchie, from the GMB union, which represents BiFab workers, said: "We have spoken to the company and the company has told us that this is a normal contractual dispute that they have with a contractor, and also that they have agreed that they will go to arbitration regarding this. "If that's not the case then the GMB will take it back up with the company."